Do you want to participate in a 7 day, plus 4 week coach and mentor led intensive screenwriting course? The Screenwriters’ Talent Campus: Total Immersion is focused on your creative talent, professional development, career advancement and the practical business of screenwriting. It’s 5 days, then four weeks, then two days… that will change everything. Jump to the application form HERE. £1,175. We expect to announce significant industry support soon, which will bring down the cost of attendance. The Talent Campus will take writers who want to work on commercial screenplays and provide an immersive, challenging and powerful experience. Improved knowledge and appreciation of the business of screenwriting. Significantly ‘greater confidence’ in the room. Developed ideas and projects (building on your new business acumen), increasing the likelihood of getting produced. Improved confidence, relationship and pitching skills for screenwriters. Developed skills in pitching, and projects ready to be pitched to execs in the real world. New and outstanding peer groups that will continue beyond the Talent Campus. Thanks for a totally mind blowing week, for making us Talent Campers feel like rock stars and for making me feel like anything is possible! A series of mentor and TC team designed assignments, tasks and challenges will start the process before it’s even begun. This is the intensive springboard period where massive shifts will cause you to take leaps and bounds in your career and writing. Story Pitch and Refining Ideas with John Yorke for TV / longform projects. Story Pitch and Refining Ideas with Sam Horley for feature projects. Project ignition day with mentors and start of mentoring process. Building on the acceleration of the ignition phase, and over the four weeks following , you will get weekly online meetups, coaching directly from your team coach and targeted mentoring. This is where your new writing and career muscles will be built. Four week Momentum writing and development phase. Having recreated who we are as writers in Ignition, having spent a month getting coached, mentored and immersed in our projects and community during Momentum, we now train for a whole day before attending the Crucible Party, an exclusive Talent Campus only mixer with the biggest names in the industry. The final day of Talent Campus brings together everything we have learned and experienced as we build a new plan and strategy for life beyond Talent Campus. Final preps for and attendance of the Crucible Party. Strategies for continued success beyond Talent Campus. Talent Campus 7.0 is by application only. Application does not mean you will be offered a place, nor does it obligate you to attend. If you are offered a place we will get in touch to discuss your plans and outcomes. As the application requires answers to several questions (as well as an uploading of supporting documents), we advise you to look through the application thoroughly before the deadline. Jean Kitson is an agent representing film, TV, theatre and radio writers and particular interest in both mainstream drama and children's media. Gareth produced The King's Speech and walked away with an Oscar, a BAFTA and countless other awards. Iain is an established and award winning international film producer with a credit list as long as your arm! Barbara Machin is the BAFTA and EMMY award winning screenwriter who created BBC1’s worldwide selling hit series Waking The Dead. ‘Being surrounded by the support and love of this group is something I will never forget as long as I live’. ‘Talent Campus has given me the confidence to keep writing and a much better understanding of the industry’. Jane Helliwell – Screenwriter // 5 Stars! ‘At Talent Campus your pitch will improve beyond your imagination’. 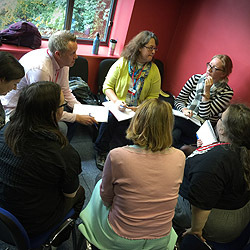 The Talent Campus exclusive sessions have also been absolutely incredible – John Yorke, Kate Leys, Lucy Hay, Chris Jones, Julian Friedman, Pilar Alessandra – all giving us their insights and advice on our individual projects. Plus special sessions with Chris McQuarrie and Carl Gottlieb. I’m not aware of a screenwriting course where you can get that kind of intensive input from such an experienced bunch of people, who are currently active and working in the business. I’ve made massive progress with my story thanks to the highly supportive personnel and framework of TC both collectively and also within our smaller group. When I complete my first draft I reckon it’ll be in the region of 12 weeks quicker than had I been writing it independently of the program. The calibre of industry professionals I’ve had access to is quite simply incredible. The highlights have been being taken seriously and getting script requests though Pitchfest, and developing a supportive, inspiring peer group. Really great course with lots of knowledge learnt and experience gained. The mentoring outside of the Talent campus sessions has been the most rewarding, and its great to have a mentor as well as be in a smaller group of writers to chat to and get feedback from about our specific projects. I have gone from writing alone, to writing with the strong support of a peer group of fellow writers. From using only my own judgment, to now working with professional script editors and producers who are assessing the quality of my work and helping me decide which projects to pursue in terms of their place in the market. I’m learning and developing so much. It’s been especially valuable in helping me develop my networking and pitching skills. I really enjoyed meeting execs and pitching and felt so much more relaxed than I’d ever imagined I would. I feel more confident in networking and pitching situations and I’m looking forward to more. 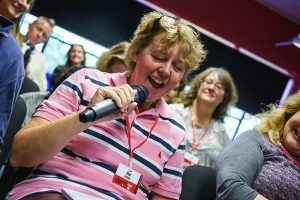 Although I was certain that Talent Campus was going to be brilliant, I wasn’t at all sure it was going to develop me where I most needed help – networking and pitching. To my delight, those have been two core areas of focus of the course so far and I feel that I have made a great leap in both my networking and my pitching in such a short time period. This resulted in a much-needed boost in my confidence. I am sure I will continue to feel the positive effects and profit from the relationships and contacts made long after this inspiring program has ended. I have learned heaps professionally: all the varied training sessions were in-depth and expertly delivered. Being mentored by a working producer has been invaluable. The support our group has given each other (and not least, were given by the organisers) has made the whole experience a pure joy. The very best thing that I have gotten out of the Talent Campus so far is the opportunity to really get to know several of the other Campers, especially the ones in my mentor group. My mentor, Karol, has been phenomenal! I see us keeping a relationship going for years to come. Our group has grown pretty tight and I hope that we maintain our connection and collaborative energy long after the close. It was a wonderfully, enriching experience where I have further developed my knowledge of the craft, but also I have made twenty-odd new friends who I’m confident will remain friends for life now. The Talent Campus has pushed me further, faster, than almost any other experience I’ve had in my screenwriting career to date. So as a way to fast track a career, I have to say this is unparalleled. It has been a shot in the arm of creative energy, giving me more confidence in my abilities and understanding. It has taken me to a higher level and reinvigorated me as both a writer and as a human being. It has challenged me to set the bar higher for myself and be even better. It has released more of the authentic me to come out to play, helped me to let go my feelings of inferiority and improved my self-belief no end. It has driven home the fact that, as well as striving for excellence in our writing, interaction with the right people is crucial to our own development. It is a unique and invaluable opportunity and I am honoured and to have been selected to take part along with my fellow talented creatives. I know for sure it will pay massive dividends for us all in the future. My ambition now is to replay the faith shown in me by Team LSF, by taking everything I have learned and putting it to best use to make progress in the industry. It would be a massive disappointment to me if Talent Campus was not funded in 2016 and beyond, allowing other talented emerging writers the same opportunity. Having run Talent Campus six times now, we are rebuilding it with all that knowledge behind us. The main difference is that we have focused more energy into the ignition phase, the first five days. These five days are unquestionably the most transformational stage of the program with delegates experiencing both life and career changing breakthroughs that impact ALL areas of their personal and professional lives moving forward. Also. the second half no longer takes place at the Screenwriters’ festival, so we focus on greater intimacy and individual support.